Fantasy sports growth in North America during 2016 increased to around 57.4 million mostly young male players according to new research by Ipsos Public Affairs in Canada on behalf of the Fantasy Sports Trade Association (FSTA) located in New York. 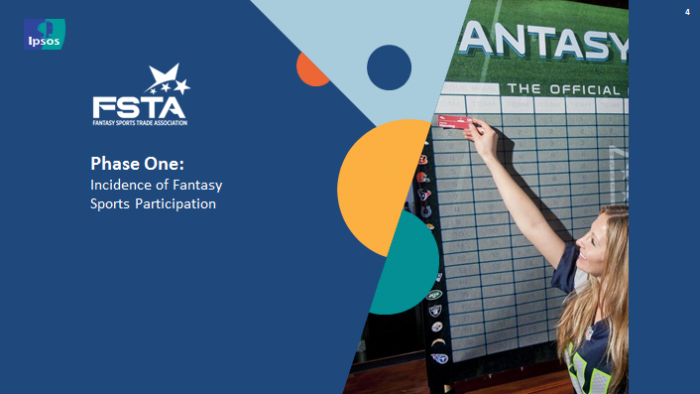 Since the study covering both traditional and daily fantasy began in 2013, the boom in fantasy participation peaked in 2015 and then grew this year by an almost 1% increase making the new tally the highest in the history of the limited study. 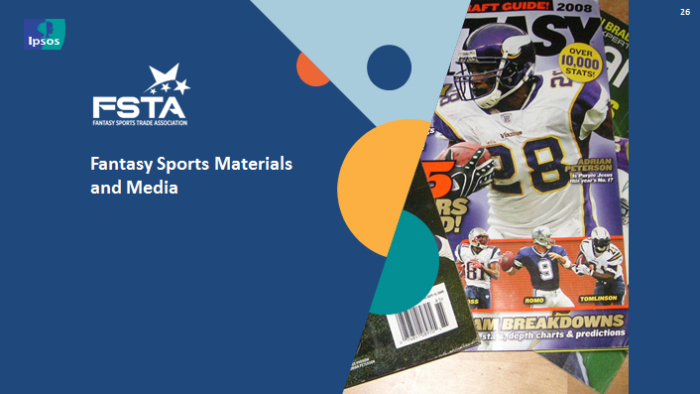 The Sports Techie community blog welcomed the opportunity to peruse the information shared yesterday with the 2016 FSTA Summer Conference in New York City. I was not allowed to speak to anyone about the newest findings at the FTSA or Ipsos however four questions were answered by e-mail about the state of the industry including, the possible FanDuel and DraftKings merger, fantasy eSports momentum and the new fantasy football convention led by professional quarterback Tony Romo that the NFL has legal issues with. Read more about this in the FTSA Q & A section below. The industry is maturing at a fast rate because of advancement in technology resulting in more and more states seeking to impose regulatory measures to help control the growth, protect player’s interests and ultimately tax the billions of revenue profits. Fantasy sports players are younger, better educated, with higher HH incomes and more likely to have FT employment. The fantasy sports industry has exploded across the U.S. and Canada the previous two years as the 15% growth rate shows leading up the this year’s record number of 57 million. I am not surprised by the amount of people who play and neither am I shocked to see the unprecedented growth slow down this year most likely due to the national movement to classify fantasy sports as a game of skill, therefore, a form of gambling, instead of a game of chance that needs little or no state or federal regulation, as the laws read today. “After two years of rapid growth fueled by the innovation of daily fantasy sports it’s a true testament to the loyalty and passion of fantasy sports players that so many recent adoptees have become regular players while the industry continues to attract new players,” said FSTA President Paul Charchian, in a press release. I have played the season-long NFL format with my brother’s friends from Washington State University over the last twenty year mostly on CBS Sports and love it, especially as a second screen companion. Watching point totals increase in real-time on my digital devices as you match up with that week’s opponent is awesome and fun. Our league tried Yahoo Sports and ESPN services over the years because CBS Sports charges a fee but in the end, their fantasy football sports tech solution is top-of-the-line (imo) so we went back. A core of the same players since the league’s inception is still intact and new players fill in as people drop off much like happens around the country and world. It is comforting to know that 82% of players still play season-long fantasy sports along with us. Current State Of The Thriving Fantasy Sports Industry – SportsTechie blog. These are some of the findings of an Ipsos poll conducted for the Fantasy Sports Trade Association. Phase One of the survey, conducted from January 22-February 1, 2016 included a representative, randomly selected sample of 1,212 U.S. teens and adults and 1,238 Canadian teens and adults from Ipsos’ online panel who were interviewed online to determine the fantasy sports market size in the US and Canada. 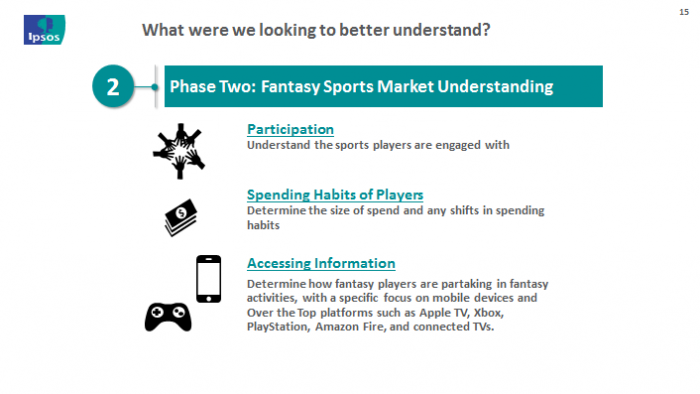 For Phase Two of the survey, conducted from April 14-19, 2016, a representative, randomly selected sample of 1,000 U.S. teens and adults from Ipsos’ online panel were interviewed online to assess spending behaviors and playing behaviors of Traditional Fantasy and Daily Fantasy players. The margin of error for the survey is ± 2.7 percentage points. The data was collected in a manner which ensures that the sample’s age, gender and region composition reflects that of the actual U.S and Canada populations according to Census information. All sample surveys and polls may be subject to other sources of error, including, but not limited to coverage error, and measurement error. Industry Growth Continues as More People are Playing More Often. How does the FanDuel and DraftKings merger talks affect the industry? As an industry trade organization it is not appropriate for us to discuss this type of speculation so we must decline comment. Is iGaming part of the FSTA future? No our organization is strictly for fantasy sports. Unrelated to iGaming, one new area we did address yesterday for the first time was eSports as there is a strong fantasy element to that growing sport. Is New York going to legalize daily fantasy sports after making changes, if so, what are the changes? The legislation is currently in the final stages but as we have learned you can never predict the final outcome of the legislation until it has the Governor’s signature. Many bills are changed right up until the last minute so we prefer not to speculate. What is the FTSA take on the NFL once again forcing postponement of Tony Romo’s national fantasy football convention (NFFC)? No comment of this topic. In terms of the Q and A, I feel the rumor of a FanDuel and DraftKings merger sets up a near daily fantasy sports monopoly (which is illegal in America) situation so pay attention to this ongoing negotiation. It was surprising to me that a trade association that wants to be the industry standard would neglect to speak to us about this rumor because if it happens, they will certainly have plenty to say at that point. Not a very proactive stance by the FTSA, rather it is very reactive. It is interesting to find out the FTSA is not interested in iGaming stating it is not a fantasy sports business, yet our previous blog featuring WinView discusses how they plan to enter the fantasy market with their two screen synchronization of live sports gaming business model based on rewards, not cash, which encourages chatting between opponents, all while protected by 26 patents. Our question about New York State and their ongoing battle to either regulate the industry or continue to make it illegal was answered fairly. I am a Political Science major from Whittier College and understand the process. Why does the part about bills changing right up the last minute to me feel like a scene in a movie where a large payment (by the mafia, a business owner or investor) to a legislator or senator is made at the last second to seal the deal? This is pure speculation on my part. I asked them about the conflict of interest between the NFL and the NFFC for the second consecutive year and received no answer back. When you look into this story, it is troubling for the industry because the NFFC is accusing the NFL of tampering with sponsors while the NFL sits back and says no comment after stating publically that the convention has aspects of gambling which the NFL does not approve of. All this while two NFL owners, Robert Kraft of the NE Patriots and Jerry Jones of the Dallas Cowboys have partial DraftKings ownership. The NFL has stayed away from this type of investment unlike the NBA and NHL. Perhaps this means at some point, the NFL will launch their own proprietary daily fantasy sports platform and keep all the profits as each state attempts to figure out their regulatory stance on DFS and whether it is a game of chance, or a game of skill, therefore gambling. Fantasy players are more interested in sports because of fantasy, with 64% reporting they are watching more live sports because of fantasy and 61% saying they read more about sports because of fantasy. Sports Techie, the steady growth driving fantasy sports towards record numbers is mostly because more people are playing more often. Season-long fantasy remains popular with 82% playing the traditional format. While 61% of those surveyed want playing fantasy sports for cash prizes to remain legal as it is here in Georgia but not in Washington. The amount of fantasy sports league spending has increased. Polling data indicates fantasy sports players are younger, better educated, with higher HH incomes and more likely to have FT employment. The survey also says, fantasy sports players are spending on average $556 a year on fantasy, up $91 from last year. – $184 in traditional league spending. – $54 in materials spending. – $318 in Daily Fantasy Sports spending. Fantasy sports media usage is growing because fantasy sports players are bigger sports fans. The trend towards players engaging with mobile and other emerging platforms such as the PlayStation, Xbox and OTT set tops, continues to grow as the predominant way (61%) players consume fantasy. The use of Gen 4 Gaming consoles for fantasy is experiencing a large rise; one device, many usages. There is now equal reliance on the desktop/laptop as there is for the mobile/tablet for fantasy activities. Given this reliance, many would cancel their phone service if they couldn’t review fantasy on it. Managing an average of seven teams seems like a lot until you break that down by sport such as football, baseball and basketball, and hockey and golf, along with upcoming sports like fantasy racing NASCAR, fantasy MMA UFC and maybe even fantasy drone racing, in the near future. Interesting to find out the more niche a sport is, the more teams a player will manage, hello fantasy robot fighting and fantasy eSports. Although subscription to the internet, mobile data and satellite TV are increasing, cable and Sirius have stabilized. Subscription to content continues to rise, led by Sunday Ticket, NBA and MLB content. The bottom line is this, players continue to be more interested in sports because of fantasy. There continues to be fragmentation in the industry and with the government which is why the FSTA is in business as an impartial and non-profit organization overseer. My advice to the FSTA is to stop toeing the line and become more proactive with the industry because that makes the business more transparent, doesn’t it. Play on fantasy sports gamers with game six of the NBA Finals, soccer’s Euro Cup 2016 and Copa America 100, and Major League Baseball because you can, because it’s fun, and because you can win cash and prizes, along with ultimate bragging rights.